1. In a bowl, combine marinade and set aside. 1. In a container, add spareribs then season with salt and pepper. 2. Pour marinade then toss to combine. Marinate for at least 30 minutes inside the fridge. 3. 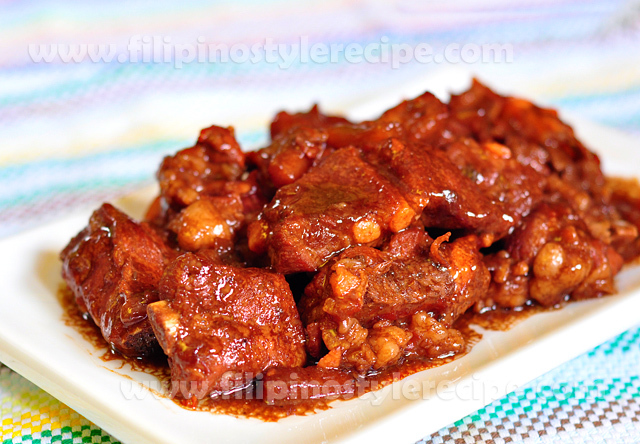 When ready, remove spareribs and reserve the marinade. 2. Add spareribs then continue sauteing until light brown. 3. Pour marinade and water then simmer over low heat for 45 minutes or until tender. Add water if necessary. 4. Add pineapple then cook for 3 minutes. Adjust seasoning according to taste. 5. Transfer to serving plate then serve with steamed rice.